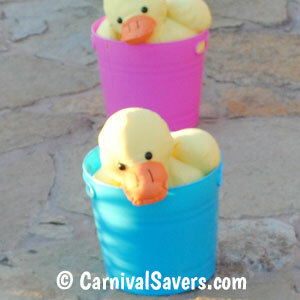 Easy Spring Carnival Game Idea - Ducks in a Row! Small Sized Hula Hoops Work Great for This Game. Ducks in Buckets so they Don't Tip Over. Stand Behind Line -- We used a pastel pennant (suspended between chairs) but you can use sidewalk chalk too! We set up our ducks in large buckets and lined them up starting with the first duck about 2 feet from the starting line and spacing the ducks about 3 feet apart. 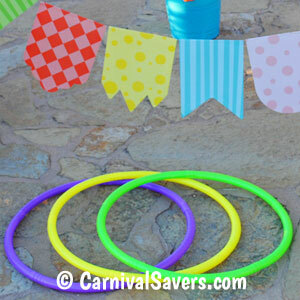 Children are given three rings to toss for this carnival game. The goal is to toss the rings over the ducks in order starting with the closest duck to the farthest. If carnival players ring all three ducks in order, they receive a top prize, if they ring just two ducks they win a middle prize and one duck or no ducks is a consolation prize. This is a fantastic game for all ages of kids - but even your preschoolers are able to play this game well! This spring game is perfect for school carnivals, spring flings and more! It is easy to store from year to year and is an inexpensive game to purchase and looks like a "larger" game as it takes up a larger space than a small table top game. 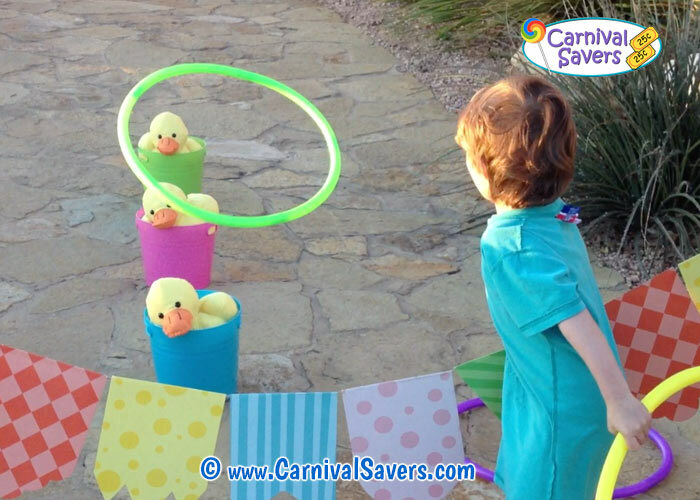 Brand New - See our Video Showing this Carnival Game Set Up & More - Click Here! GREAT CARNIVAL SUPPLIES & PRIZES for the DUCKS IN A ROW GAME!